Lithuania (Republic of Lithuania) is situated in the North Eastern Europe, belongs to the group of Baltic states. The country covers an area of 65,200 km² and its population compromises of 3.37 million people. The official language is Lithuanian. Most of the schools are established by local government. Even if some schools have education based on religion, they are still established by local government. Around 90% schools are public and 10% private. Education is compulsory from the age of 6 till 16. It's free of charge. Kindergartens are no compulsory. Children have to be 2-3 years old to attend. Majority of them are organized by local government, only some are private. There is hardly any cooperation with primary schools. Average class size of 25 pupils. On average there are 4-5 lesson in one day. There is no possibility to pick own subjects. There are some extracurricular activities available, but with the need of private funding. Grading system 1 (worst) to 10 (best) is used. It is uncommon to use computers by students. There are no uniforms, except for some. There are meal available at schools, but have to pay for it (for socially supported families its free of charge). There are no leaving exams. About 88-90% of secondary schools are organised by state and others – are private. About 80% of secondary schools are general schools and 20% are vocational. In classes there are from 25 to 30 pupils. Schools receive funding from local government. On average there are 6-7 lessons in one day (31 lessons total per a week). It is possible to choose a school if classes aren’t full. 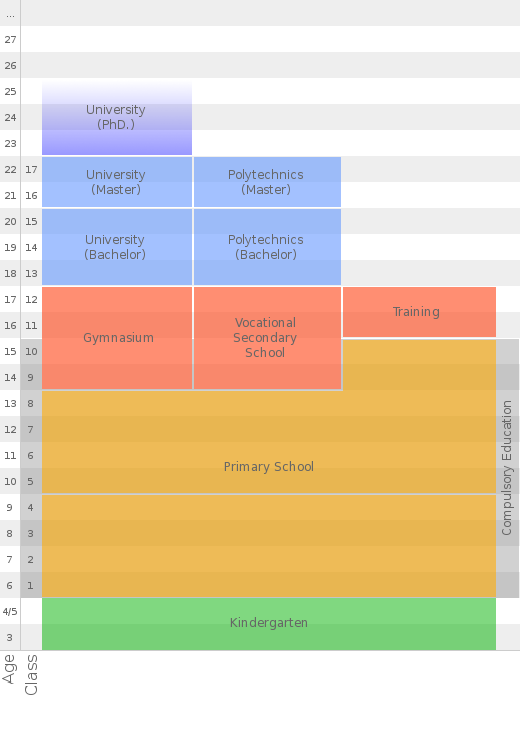 In 10th grade all pupils have to choose the educational profile with on which they’re going to study till graduation. Grades in schools are from 1 (the worst mark) to 10 (the best mark). Recently a law which defines that all schools have to have student counsels and what they have to do has been released. In secondary schools there is some extracurricular activity to deal with students’ business after school but most of extracurricular activity is private. In almost every school in Lithuania (in near future in all of them) every student can use the computer and there are informational technology lessons. The use of school uniforms are like in primary schools but it is more common between secondary schools to use them. The possibility of eating a school meal is completely the same as in primary schools. Entrance exams aren’t necessary in all schools, but leaving exams – graduation exams - are necessary. About 70% of universities and colleges are organised by state and about 30% are private (this is the amount of private universities and colleges either they are or aren’t legal. University or college is called illegal if its diploma isn’t certified by Lithuanian government). Entrance exams are necessary in higher education schools. They differ depending on which university or college you choose to study in. There some schools in Lithuania organised specially for disabled students. In educational system as well as in the labour market Lithuanian government is following integration policy. Although in higher education system disabled students aren’t in such a good position. For now government is planning to improve teachers’ prestige (among society and students), improve the psychological situation and working conditions in schools. Regarding to tendencies in society and opinions of teachers, students and parents these reforms won’t be so effective as it’s suspected.